As more B2B marketers turn on ABM programs, they need a data-driven automated way to segment their targets and launch tailored marketing and sales programs. Many Lattice customers are starting to leverage predictive analytics for that and seeing great results. However, often, marketers have to refine the definition of their A targets based on volume of engagement and predicted rate of conversion to ensure the efficient use of marketing and sales resources – for example, too many A-rated targets could overwhelm the sales team, while too few can starve the team. Until now marketers had to do this task manually in their marketing automation or CRM platform. 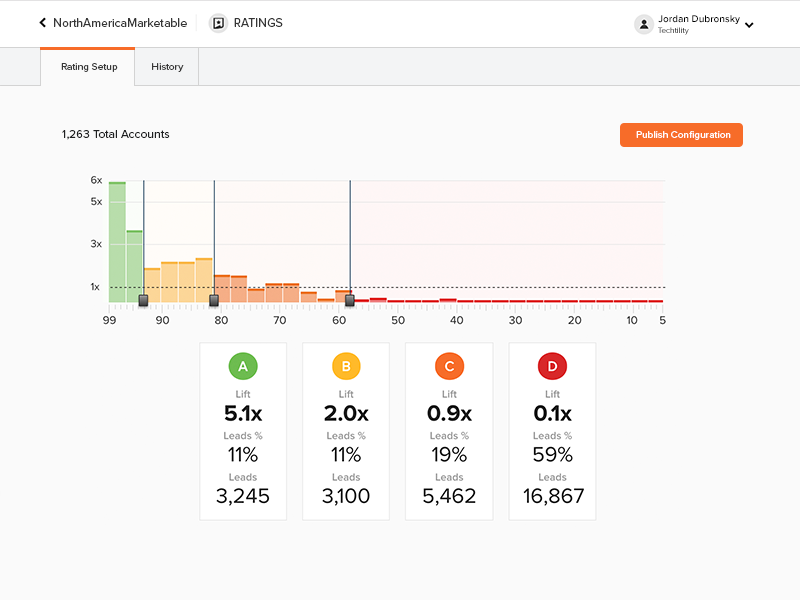 With Lattice Predictive Ratings, marketers can do this task in just one click. Take for example Lisa, who runs marketing ops for a multinational. She is tasked with scoring the target accounts list and identify A-rated accounts to be targeted by both sales and marketing teams as part of an ABM program. To accomplish this, Lisa leverages the Lattice self-service modeling platform to build a predictive model and score the target list. She then uses Lattice Predictive Ratings to create A, B, C and D segments that have just the right balance of propensity and volume. By finding the right balance, she is able to find the right segment of targets that fits the program budget and have high propensity to engage. Without this capability, Lisa would have to spend hours manipulating the data. Here is another example. Jordan heads demand gen for a mid-size B2B tech provider. His company’s sales efforts are overloaded. He leverages the Lattice self-service modeling platform to operationalize SLAs across teams. Jordan needed to get the deployment off the ground quickly, so he provided A, B, C and D ratings that could be synced to CRM and marketing automation. He used Lattice’s out-of-the box ratings to operationalize predictive segments with a few mouse clicks. 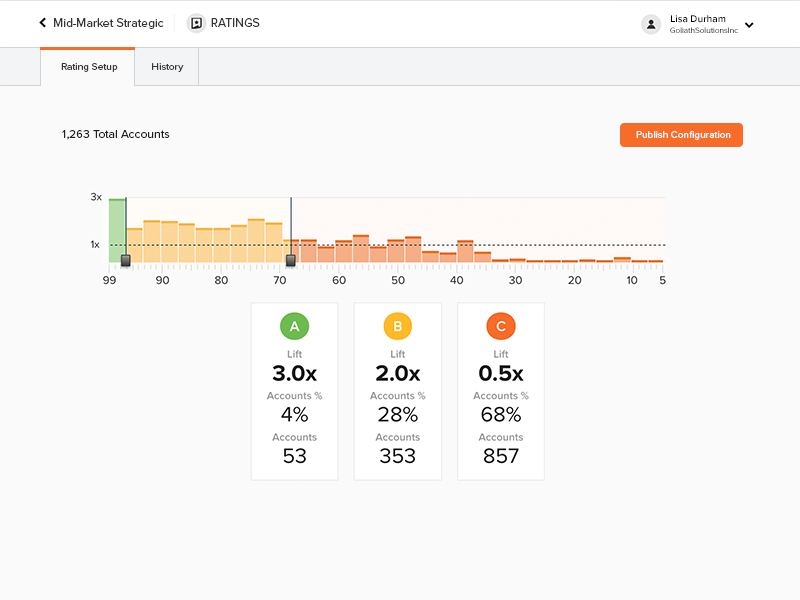 As internal discipline grew, Jordan needed to tune the volume in his A and B buckets to more closely match sales capacity, so he changed his settings in the Lattice platform. When he published his customized ratings, new leads volume to sales increased within minutes. Eventually, tighter SLA standards in sales, combined with a need to clean out his database, led Jordan to create six different predictive segments from his lead scoring model, without sending tasks to his CRM admin, or creating new flows in his automation platform. 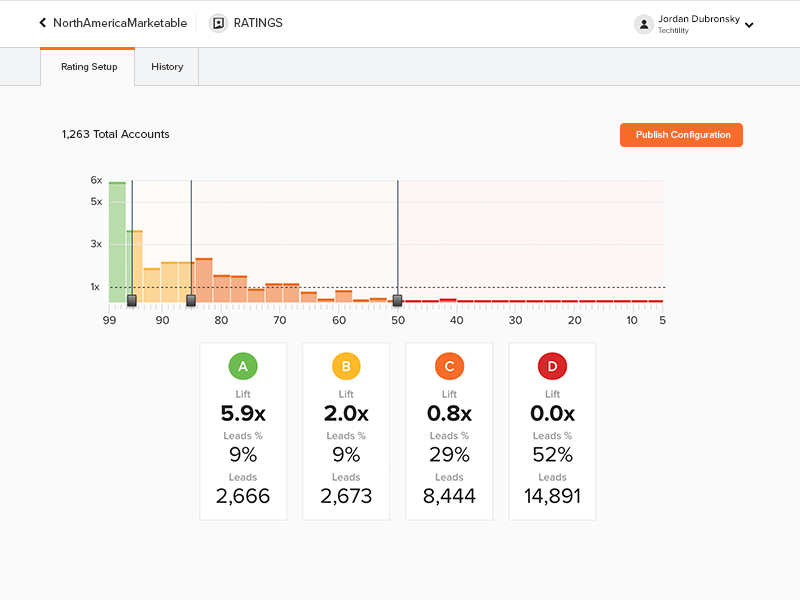 With Lattice Predictive Ratings, marketers can now manage the volume of targets for various marketing and sales programs in an automated way, making sales and marketing activities much more efficient with their ABM initiatives. If you are a Lattice customer, we would love to have you try this new feature. If you are a prospect, please reach out to us for a demo.